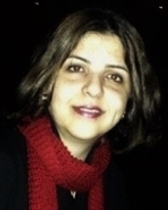 Pouye Khoshkhoosani received her PhD from the School of Middle Eastern and North African Studies at the University of Arizona. She has taught Persian at the beginner, intermediate, and advanced levels at the University of Arizona and at the Arabic, Persian, and Turkish Language Immersion Institute at the University of Wisconsin-Madison. Her research examines the role of poetry in legitimizing Iran’s Safavid dynasty (1502-1736 C.E. ), focusing on the image of the ruler. She also explores the role of Safavid ideology in shaping poetic discourses of time and examines issues of style and genre in 16th- and 17th-century poetry. She also writes short stories. She is interested in the subjects of women, immigration and the clash of cultures within Iranian diaspora communities.